Here's my 2003 KHS solo-one. I got it on ebay back in November to be a fun addition to my stable, but SSing has been more addictive than anticipated. The above photo shows the first modification I made to the bike. It came with your typical flatbar, but for a reason that I cannot recall, I put the handlebar from my beach cruiser on the bike. No other mods, no new brake housing, just a new-to-me bike with awesome bars and a sweet springy steel frame. It stayed that way til I got my $hit together and put the bike together properly. There's a new Cane Creek headset, XT brakes, Ritchey steel stem, American Classic seatpost, oldschool Vetta gel seat (off my Ibis Avion), and yes, new brake cable housing. The softail is pretty cool IMO. It doesn't bind or flop; it just takes the jitter out of the jittery parts. It does double duty as a beach cruiser, market bike, and when I put slicks on it, a sit and spin tarmac bomber. Anyone else own one of these? What do you think? I really like the first build with the rigid fork. I really like your build. I want to know about that softtail. Notice much of a difference from a hardtail? Hey! I got one too. Nice handling bike. I made mine into a '69er by just exchanging the front wheel for a 700c. I think it rolls better in the dirt and does away with any front suspension. Wheel fits the fork just fine, but you have to use disc brakes. Yes, I do. Since I put the sus fork on, it's less noticeable but there are still times where I FEEL the whole assembly doing its job. It's not disconcerting; it feels like a couple extra cm of vertical compliance. It's most apparent after short fast drops and bumpy, dry trails. I'm satisfied with the handlebar. It's not the stiffest thing, but gripping the part forward of the brake levers gives a great position for climbing. Thanks everyone for commenting. 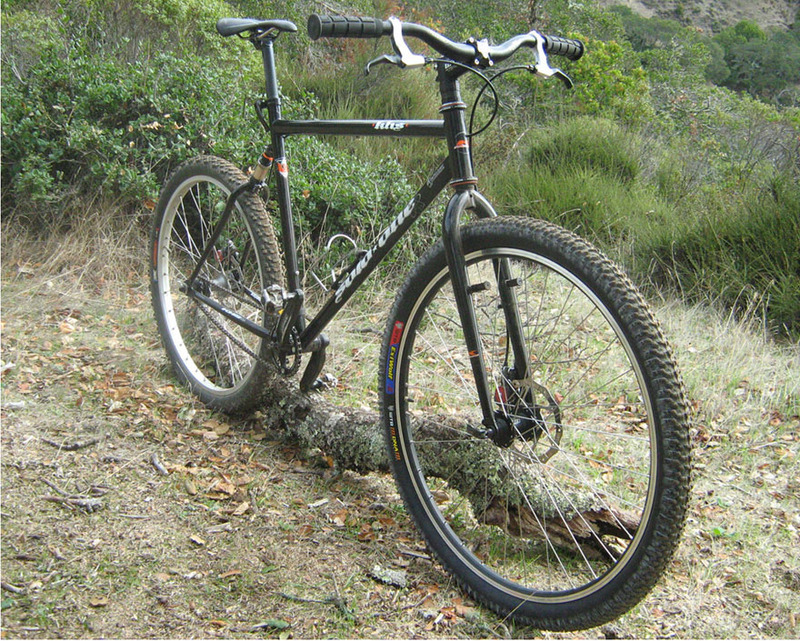 Project for the afternoon is putting the rigid fork back on and taking it out to the Stanford foothills. Here's a picture from a ride out there yesterday. You don't use a tensioner? I need one on mine to get enough tension. 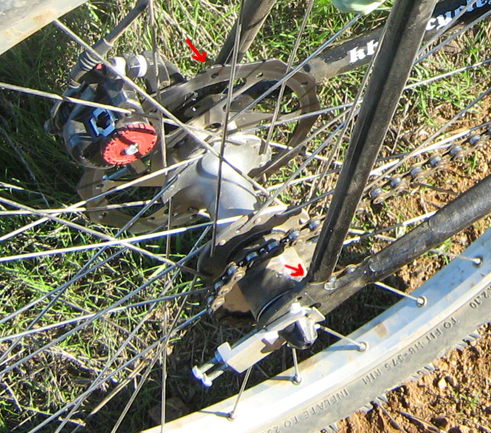 My gearing is 32-18 and I've got a nice Surly tensioner on the drive side. How old is yours? I bought mine two years ago and I think it was a 2006. Have you replaced the elastomer yet? You can put a fattie on the front for sure. I have a Weirwolf 2.55 on mine with plenty of clearance. At about 25 lbs air pressure, it takes the edge off. My gearing is 38-18. I don't need a tensioner and my chain isn't that loose. About as tight as yours, judging by the pictures. What hubs are you using? Mine is a 2003 and came with a 135mm, freewheel, bolt-on/hex-on hub. Pretty similar to Paul's Word, but made by "Power Tools", perhaps a KHS house brand. I haven't replaced the elastomer. Have you? Last edited by coborop; 06-27-2010 at 10:53 PM. I bought it as a frameset for $140. Best deal on an awesome frame. I like my '69er setup so much I'm dreaming for a custom frame by Castellano, like their Fango soft tail. I started with an LX hub and conversion kit and now laced a Woodman hub to an Alex DM24 downhill type rim. It's 24mm wide and rides solid. I like the cartridge bearings and cassette for rebuilding and gear changes. The shop guys really like the bike but they were checking over my rear triangle welds where they insert the dropout plate into the seatstays and said the connection is solid, the weld good, but a bit skimpy in the amount of material. You should check yours. The pic has arrows pointing to the area. Same shock as yours, I was experimenting with a harder elastomer I saved from a really old RockShox and it was too narrow. I'm about 220 with all my stuff, so I want a firmer feel, I think you could cut a new elastomer from a car or mechanics shop. I haven't needed to change the bit yet and that's with about 1000 miles on it. I get about an inch travel with 50 percent sag. Thanks for the heads up. Mine look ok to you? I had an older Team ST, and no matter what I tried the chain would get too loose when the elastomer was compressed. 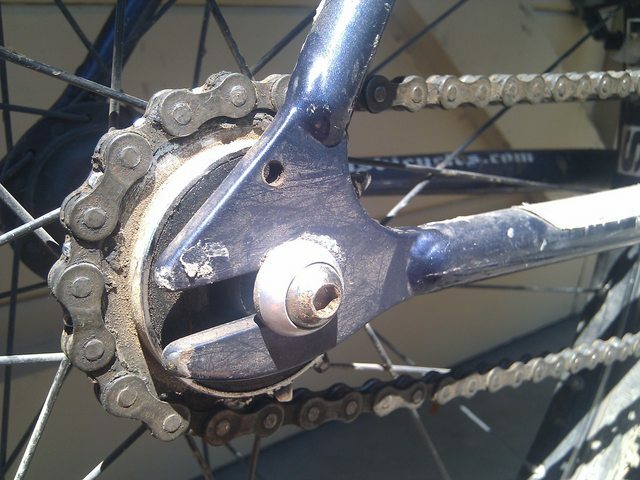 The bike had vertical dropouts, and I was using a tensioner so maybe that was the issue. I kinda miss it, but it was beat to hell and I was worried it would die an awful death with me on it. It's the fourth! Go for a bike ride and drink beer! Bye!